April 2018 and it’s the start of the triathlon season for many athletes. For me it was a return to the West Lancs triathlon held at Edge Hill University in Ormskirk. Last time I was here was the summer of 2015 and although the event hasn’t changed much in that time, I as an athlete have continued to grow and learn from the close athlete/coach relationship I have experienced since then. Having competed in triathlon for the last 6 years the way I view and approach each race is now completely different from those early days. Being on the start line of any event, no matter how big or small, is now something I look forward to, as it’s an opportunity for me to see what I’m capable of, really pushing my limits and testing where my boundaries are and West Lancs was no different. People may look at my performances over the last 6 years and just assume I have gotten fitter and this alone is the reason behind my improving performances but I, and those closest to me, know that it is so much more than that. The main improvements in my performances have come from my mentality before, during and after the events not from the increases in fitness and strength. To have the composure to know what I need to do whilst also being able to handle any curve balls and the confidence to be able to execute it has been massive in my progression. So what does all this mean when it comes to race day..
Before the event it was a a case of making sure I was fully prepped with regards to the course and what my strategy would be to get the best out of myself on race day. The swim is a 400m pool swim so things like pacing and making good tactical decisions with regards to other swimmers in the lane are just as important as if you were in open water. I was fortunate enough to be off in one of the later waves so luckily was able to focus on my pacing and was able to exit the water feeling strong and ready for the bike leg. During this part of a triathlon is often where an athlete can either give too much or not enough, saving themselves for the run. For me its a place where mental strength really plays a part, knowing how hard I can push without going too hard and in recent years its really been a place where I have pushed my boundaries. Coming in off the bike I dismounted alongside my new team mate Samantha Sugden and with both entered and exited T2 together. Now onto the run and the course at West Lancs is quite intricate in places. The first half being through the university buildings and the second half on a shale track before finishing on the running track. Just recently my running has been going from strength to strength something I accredit to both a higher percentage of off road running in my training and again testing boundaries, pushing myself the whole way through the run not just settling for position or assuming I’m going to be passed. Having completed several triathlons over the last few years the feeling of 'jelly legs' after the bike can be expected, but the key was to remain composed and concentrate on trying to keep form and executing the best run for me on the day. Coming onto the running track, and with words of encouragement ringing in my ears, I pushed onto the finish line. Being able to race is such a privilege, being happy, fit and healthy is so often overlooked on the quest for ‘glory’. For me racing is a way to express myself, ensuring I give it my all, all the way to the line no matter what. The West Lancs event was a great start to the season with all Racepace triathletes down to race. Being part of such a supportive team is always great and to have everyone, including family and friends, there for the first race was incredible. First race of 2018 8th April 2018, a chilly but sunny day getting warmer as the day went on. Saturday I took more time over my race day preparation, checking my kit more than once and ensuring I had everything. This having a coach and being accountable is very new and having a positive impact on even my race day preparations. I haven’t done this course before yet I feel I know it well, we have recced it once, I have looked on line and on Saturday I go do one final check of the bike and run course. I am clear on my goals for Sunday. I have to be controlled, composed and I am aiming for under 1:06 and I recon Sarah will beat me by 3-4 mins. Race day morning and I am my usual calm but excited self, slightly nervous because this is my first event as part of Racepace and with a coach, I can feel the pressure but this is good and I absorb it and grow with it. I rack my bike already fending off one question from coach, I have vowed that although I am learning, I am also very experienced, I have grown so much and I need to take on board what I have and am still learning over these last few months and use it without doubting what I can do and know to do. The rules are don’t change anything on race day. So I rack my bike with my usual calmness, chatting with others around. Mostly men as being a fast swimmer in a pool triathlon you have to deal with the fact women are the minority, and not be intimidated by them. Race briefing goes on and were sent off to our lanes, when I reach my lane I have 10 seconds to get in. No time to ponder life or panic. I’ll just get in then shall I, I say to the marshal, yes and ill count you down, 5, 4, 3, 2, 1, and I’m off swimming in a controlled manner… oh what’s this my chips coming loose, yes it is, I reach down just as it comes off. Right it’s in my hand, turn and swim back this is effectively a one handed fist drill, reach the end having decided I’m not stopping, ill put it down my top. I show the marshal it’s come off. Continue swim, controlled and building, I normally swim like I’m doing a triathlon a little bit conservatively, I push to my upper limit of conservative but I’m not blowing and I’m happy with the pace. Then sets off another competitor, he pushes off same time as I turn, I only have 100m to go, ( me knowing this with absolute certainty is a new thing, I love it) he seems fast so I drop on to his feet, may as well let him do some work for me and ill push on. Get out and jog to transition. Telling the swim exit marshal my chips come off, he tells me to throw it to him, then someone hands me it back, “thanks” and I stick it back in my top. Steady and controlled through transition, no problems, tell exit marshal chips off as mat doesn’t beep, ok so I’m not going to get any splits but I must remember to get my chip to the finish mat. Mount bike with a hesitant scoot mount. Off I go, shoes on, traffic lights on green – never my luck. I will take that. Bike course is ace three laps, I know route well, undulating and some decent corners I push my aero position as much as I can, I turn my legs with as much power and cadence as I can without burning out, riding within my limits. I take drinks every lap, this is not normal on a sprint and I do it smooth as I’ve been taught, and practiced. I concentrate the whole way round extremely novel for me. As I dismount Sarah my team mate appears, oh hello (in my head, no out ward reaction she’s 1.30 ahead of me). Smooth transition and we leave almost together. She’s a fast runner so I have to ignore her and do my own thing, manage myself. I am running well but she’s still just ahead either she’s slow or I’m too fast, but I feel ok and I’m comfortable so keep going. After about 2k she starts to pull away but not as much as I would expect, no one else around except a goose that hisses as I pass…. Up the twisty bits controlled and a man passes me, concentrate on what your doing don’t push too hard yet. Get to the switch back and I know I can push a little if I can but then the path becomes very rough and I need to concentrate on my footing and keeping strong. Once that’s over I can see the finish and I try to open up and push only a little more…feel a bit sick be careful, then on the track wind it up…. Legs not listening, faster, I said move it, legs still not listening, keep going nearly there. And I finish. OH WAIT pull chip out of my top and wave it over the mat till it beeps, much to the amusement of those watching and the commentator. Hug Sarah who’s stood watching having not long finished both had a fantastic race. Phew. Turned out Sarah was running great and did a fantastic time as did I so it was the right call to stick with how I felt and trust myself. No time as chip didn’t register and defiantly no splits. Eventually they worked out I finished in 1:03:54. Absolutely over the moon! 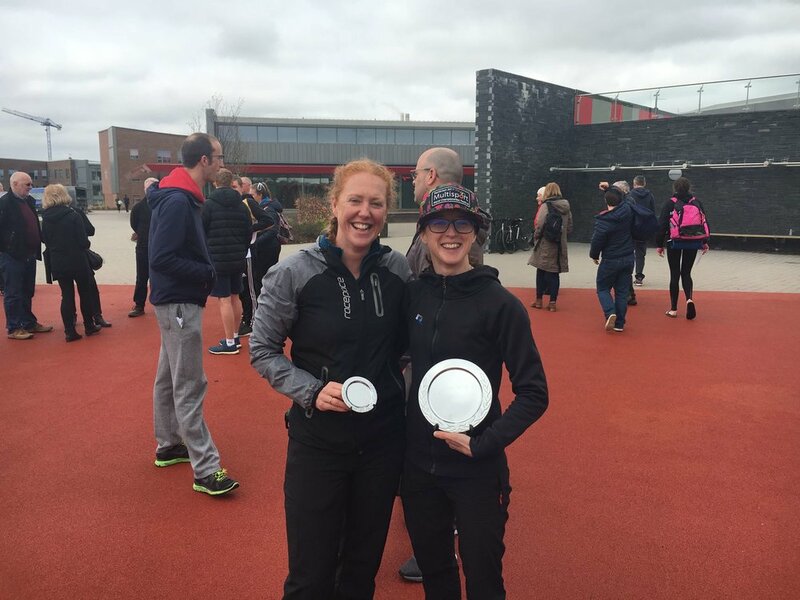 The West Lancs Triathlon is one of the earliest triathlons in the area and the impressive, modern campus of Edge Hill University was a great location for five Racepace athletes to kick off their 2018 multisport seasons. With it being a pool-based triathlon competitors were seeded on estimated swim time and set off in waves throughout the morning. With the quickest estimated swim time out of just over 500 peopleI was allocated a place in the final wave at 11:40. Travelling with coach Rodger and fellow athlete Bob I arrived in plenty of time to register, set up my bike and gear in transition and check the entry and exit points to be sure I'd be able to navigate straight to my designated racking place. Having been over a month previously for a team recce I was confident I knew the bikes course well including the junctions I'd have to negotiate. There was enough time to support some of the other Racepace athletes before warming up and assembling on poolside for the race briefing. I had a clear aim for the swim which was to be fast but controlled, so as to exit the water feeling good and composed, rather than pushing harder during the swim to gain a few seconds but starting the bike with a build up of fatigue. I followed the plan and posted the quickest swim split of the day and after a slick transition and a flying mount I was away on the bike. The three lap course meant a few athletes from earlier waves to contend with but I again had a remit - this time it was to ride smooth and controlled. With several junctions to negotiate each lap it would be easy to put down some big bursts of power to get back up to speed after each but I remained focussed on the task and maintained constant power and intensity as best I could. Before long I was back into T2 and putting on my trainers ready for the run. Phil Ellison had posted a rapid bike split and very nearly caught me up so was in the transition area at the same time - I was ready for a race! The plan for the run was to execute my fastest possible 5km which I knew meant I had to control myself in the early stages to avoid running at a faster pace than I could maintain. I thought this may give Phil a bit of a carrot to chase me down and was ready to respond if he caught me up, but I ran a well-paced run and pushed hard all the way to the line to win the race in 52:05, just over a minute ahead of Phil who finished in 2nd place. 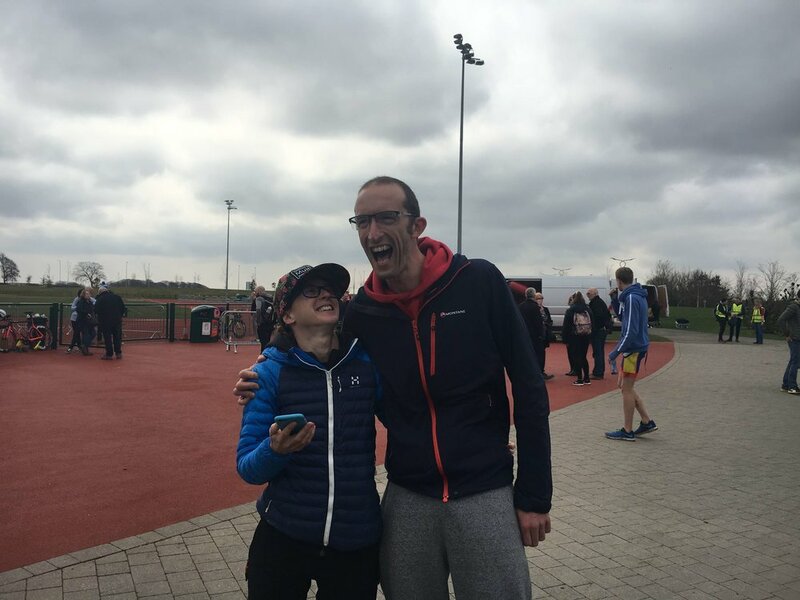 It was great to be part of such a successful day for the Racepace team with 1st and 3rd female athletes (Sarah Jepson and Samantha Sugden respectively) and Rob Cassidy and Wendy Drake also posting good early-season results. Next up for me is the standard distance race at Stockton Duathlon Festival in a fortnight's time and I can't wait to race again! Special thanks to Pete Jepson for once again using his mechanical knowledge to ensure my bike was in top shape. I'm also grateful to Arena UK for supporting my swimming needs and to Mark Egan and Egan Associates who are generously sponsoring me for the 2018 season to help me along my journey. This was my first time competing at the West Lancs Triathlon but I knew it was an established event in the North West and was looking forward to doing it. My teammates at Racepace were all competing too so it made for a great team outing and a chance for us all to see where we were at. My ‘driver’ in the event (something to keep at the front of my mind) was questioning in the moment as to what I was doing and was it to the best of my ability. Am I going hard enough on the bike, is there more to give, am I concentrating on the task at hand? These questions are things I have been working on with my coach. Executing the best race I could across all 4 disciplines (don’t forget transition – seconds can be made here…. or lost) by constantly applying my ‘driver’. The swim was 16 lengths and I was aiming for a target time of 6.15-6.20. On entering the lane and having to set off at a specific time it put me right on the feet of a swimmer who was already in the water. I was literally on his feet, hips and even rib cage at some points, this way he would definitely understand to stop at the end and let me through, he did not. We both turned at the same time and I made the decision to increase speed to get in front. This threw my breathing strategy and energy output. Adapting accordingly to how I felt for the rest of the swim I did a 6.28 . At least 8 seconds down on where I wanted to be. T1 was quite a distance from getting out of the pool so I used this time to clarify what I was doing when I got to my bike, where I was exiting T1 and where the mount line was and all while remembering to run and be as quick as possible. I was over the mount line and jumping on my bike in a time of 1m 43s. I was quick to get my feet in and get into position on my TT bike. Quickly into my rhythm it was a 3 lap loop and just over 18km. A flat course, closed roads and decent conditions meant there would be some quick bike times. I wanted to be as quick as possible, constantly focusing on my ‘driver’, push, push, push. I finished the bike leg in 32m 20s which was by no means the quickest but a decent time. Before the race I had a mental marker of being in the 31’s – not too far off. Approaching the first dismount line of the year, everything went smooth and I was off and over the line with no issues, bike straight on the rack, helmet off, shoes on first time and away I went. 51s in T2. The run was a 1 lap route which was very technical for the first half with lots of turns and twists. The 2nd half was much simpler with longer flowing sections and all within the campus grounds. The legs did not feel great straight off the bike and were quite heavy and I was not going at the speed I envisaged. Slowly, but surely though, once the blood flow was going they came back to me and I was able to run freely. During the first half it was the first time I spotted my team mates who had a different start time to me, alarm bells were ringing as I was calculating how close they might be and had they made time up (team rivalry is always good in racing – all about the banter after). I quickly put this out of my mind and focused on finishing as strong as I could. My run time was 19m 31s. Having all finished the race we all waited for the results and bragging rights at Racepace HQ. We all knew that myself and Sarah Jepson would be a close fought battle and we were right. Sarah finished 1st female and 21st overall in 1hr 1m 5s, beating my position by one as I finished 22nd in 1hr 1m 7s - the time difference was 2 seconds. 1-0 to Sarah and now for the next race and a chance to level……hopefully. Well done to Beau who won the event and Samantha who finished 3rd lady, Wendy too who was off earlier in the day and had a good performance. Now for Stockton Duathlon on the 22nd April. Wendy had a very solid race. Even with one or two mishaps, which are part and parcel of triathlon, she came home 2nd in her age-group. This performance has given her more confidence in her race sharpness. With the focus on IMUK later in the year, she's excited for some longer more calculated triathlons that are right around the corner.